OECD-EI Global Dialogue- “the Future of Teaching and Learning” was held in Helsinki on March 14-15, 2019with the support of the government of Finland. The 9thGlobal Dialogue- ISTP was a joint summit of the OECD (Organization for Economic Co-operation and Development) and the Education International (EI).The social partners of Georgia, Irina Abuladze, the Deputy Minister of Education, Science, Culture and Sport of Georgia and MaiaKobakhidze, the President of the Educators and Scientists Free Trade Union of Georgia, along with 4 other members of the delegation attended the Global Dialogue for three days.This was the second time the delegation from Georgia was a part of the OECD - EI international summit.The Georgian participants of the ISTP 2019 were: BerikaShushakidze,the director of the National Center for Teacher Professional Development, Nino Kavtaradze, the English teacher of Tbilisi Public School N150, MarikaZakareishvili, the Head of Adult Education Division of the Ministry of Education, Science, Culture and Sport of Georgia and Mari Alugishvili, the ESFTUG Executive Vice-President.The OCED/EI international summit has been the supporter of an open discussion and dialogue between the Education International member trade unions and the ministries of education since 2011.“There is no doubt, that we gather at a table because of our mutual aspirations- quality general education is a public good” - said Tony Mackay, the ISTPmoderator.“Nine years ago we never imagined that the seed of ISTP2019 based on the informed dialogue between teacher union leaders and ministers of education would grow into this important event.”- Stated Susan Hopgood, the president of the EI at the official opening of the ISTP2019. Prior the summit, on March 13, the Ministry of Education and Culture of Finland organized for the representatives of 21 countries to visit the preschool, general education institutions, vocational schools and teacher training centers.The delegates had an opportunity to receive more information about the Finnish education system, and make connections with the stakeholders of the education systems of other countries. The Ministry of Education and Culture of Finland gave the delegates a detailed presentation of the strategies of the Finnish education system, its success and results.The meeting made it clear that the success of the Finnish education is based on trust, the respectable status of a teacher in society, the close cooperation between the social partners and the community involvement. In accordance with the program of the ISTP2019, there were informal meetings between the trade union and the ministry representatives.“For me, one of the most important moments at the ISTP is that before the summit starts, I have an opportunity to listen to the leaders of trade unions of the world”- noted David Edwards, the EISecretary General at the joint meeting of the leaders of the member organizations of EI.On March 14, OECD Director of Education, Andreas Schleicher presented the main findings of the OECD and the annual report of ISTP2018. He also spoke about the needs of education systems and noted “that ISTP has been the platform for a unified dialogue for 9 years to achieve access to quality education….By sharing best practices, countries develop better education policies at a national education…. It is clear that the success of the Finnish system is not about independent activities, but on close relations… In Finland the best school is the one that is the closest to people, this is a success.” In 2019, the delegations of 21 countries discussed three main topics in two days:The need for unified management of the school system;innovative pedagogy in early education and strategies to create solid foundations and development of a sustainable school environment.The delegations worked interactively, the representatives of ministries of education and trade unionsimpartially expressed their opinions and positions in order to overcome challenges in educational systems. It was noted that strategic directions should be based on the constant promotion of teachers' professional development in the modern world, in conformity with technological boom, providing teachers with relevant trainings, close cooperation with social patrons, creation of continuous education guarantees.It is noteworthy that the first time in the history of ISTP based on the example the best experiences in early education and school readiness in Finland and Denmark, the necessity of early education was discussed, something that is a sustainable foundation. In the final part of the Summit, all the social partners of the participating countries’ delegations jointly developed ISTP2019 priorities. Deputy Minister Irina Abuladze presented the priorities developed jointly by the Ministry of Education, Science, Culture and Sport of Georgia and Educators and Scientists Free Trade Union of Georgia, to the delegations of the OECD, the EI, the European Commission and others: "Promotion of teachers' need for improvement of school system, implementation of measures necessary for promotion of teaching profession, gradual increase of teachers' basic salaries, creating a continuous chain of quality education starting from early education to vocational education". EI President Susan Hopgood once again pointed out that, unlike other international meetings, ISTP is a mechanism for promoting teacher professions and their needs at international level. ”Today we all recognize that the future of education depends on providing teacher supporting programs…A strong foundation for the education system is created by more investments ... we should build a system with trust, self-confidence and cooperation ... trust should be established ... trust is born with a dialogue with teachers and their trade unions"-said David Edwards, EI Secretary General At the end of the summit. 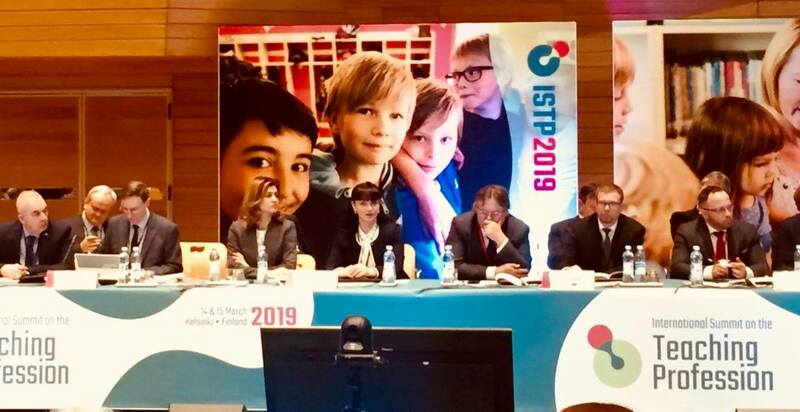 ”Today, from Helsinki, Education International, United Nations and OECD once again call on Governments to invest more in education system because the future of teaching and learning is the future of our society "- was the main message for ISTP organizers.